Don’t put any lives at risk. We feel lost when we leave home without it. We can’t help but to check it every five minutes. Our lives are put on hold when we lose it (especially if it’s on silent). These days, it seems that our lives are controlled by that bright little screen that we can fit into our pockets: the cell phone. July is National Cell Phone Courtesy Month! Being a courteous cell phone user means that you know the risks that are associated with operating a cell phone while driving. To raise awareness about the risks that cell phones pose on our streets, we’ll give you a few tips about how to use one properly while in your car. Restricting the use of your cell phone while in the driver’s seat allows you to get from one place to another safely, and it protects the drivers around you. Plus, you can avoid paying a hefty $100 fee for a first offense in Albuquerque and a $200 fee for subsequent offenses. Stay safe and out of trouble with the law. Put your cell phone away! 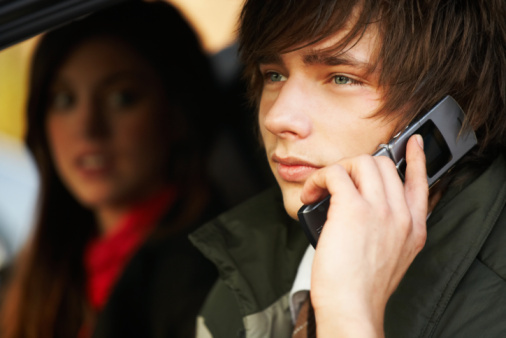 Practicing cell phone courtesy while driving may require developing new habits. If your old habits have gotten you a ticket, we can help you take care of it quickly, giving you fast and friendly service to get you in, done and on your way in no time at all!